Sandhill cranes (Grus canadensis) were nesting in North America 2.5 million years ago -- a sandhill crane fossil of that age was found in Florida. They're tall, elegant birds, with gray bodies and crimson caps on their heads. They inhabit wetlands and prairie throughout much of North America and winter in large flocks. Come springtime, the cranes form pairs, attracting their partners with elaborate dance displays, and share the responsibilities of rearing their young. The breeding territory of a pair of sandhill cranes will cover an area of about 200 acres, generally in small, undisturbed wetlands -- preferably away from human habitation -- such as wet meadows, freshwater marshes, bogs and other moist habitats. In larger wetland areas they build their nests about 300 yards from the edges. Sandhill cranes like sites where vegetation grows in standing water, but some birds will nest on dry ground. Sandhill cranes build ground nests, sometimes in water that's up to 3 feet deep. The breeding pair builds the nest together, using whatever vegetation is nearby. Typical materials can be reeds, sedges, bulrushes, cattails and other marsh plants and grasses. The cranes pull up plants and roots with their bills and toss the vegetation over their shoulders so it forms a mound; to this foundation of larger material, they add a cup-shaped hollow lined with smaller stems. The nest can be 30 to 40 inches wide and 4 to 6 inches high. Nests built on water are usually larger than nests on dry ground. Nonmigratory sandhill cranes, including populations in Florida, Mississippi and Cuba, build their nests and lay eggs anytime between December and August. The birds that migrate from the southern U.S. to northern North America in spring usually start egg-laying from early April to late May. Sandhill cranes have one brood. The one to three eggs in a typical clutch are a pale brownish-yellow or olive color with irregular brown or gray spots. Both parents incubate the eggs, and it will be 29 to 32 days before they hatch. Lots of factors determine nest success or failure for sandhill cranes. Predation is a common reason for nest failure. The parents will attack predators, leaping in the air and kicking out at birds or threatening predatory mammals by spreading their wings, hissing and kicking. Nonetheless, eggs and nestlings can be lost to racoons, coyotes, bobcats, wolves, foxes, ravens, crows, hawks, eagles and owls. Low water levels and flooding also account for nest failures. During drought years, less food and drinking water is available, and with lower water levels around nests, the risk of predation possibly increases. Sandhill cranes will sometimes abandon nests if their mates die or because of human disturbance. However, they often re-nest if their first attempts fail. The down-covered chicks are well-developed when they hatch. Within 24 hours they're able to leave the nest, and they can swim soon after that. Both parents care for their young, feeding and protecting them. The first chicks to hatch tend to be more aggressive than later ones. To prevent problems, the adults walk in different directions so one chick follows dad and the other mom. 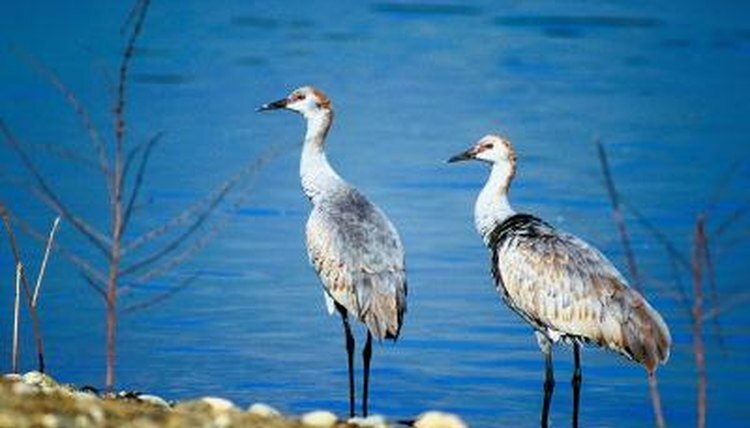 The young birds are able to fly after about 90 days, and the juvenile cranes become fully independent when they are 9 to 10 months old, just before the next nesting season. What Do Red-Tailed Hawks' Nests Look Like? What Are the Similarities & Differences Between an Emperor Penguin & an Adelie Penguin?